"The American people are “polarized.” That idea is repeated so often as an explanation for why Washington seems mired in dysfunction and gridlock that no one even stops to question it anymore. 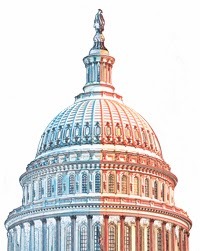 Yes, the system is polarized, in the sense that we have divided government on the federal level, or, as Dan Balz recently noted, in the sense that state governments under an unprecedented degree of one-party control are moving in sharply different directions. But how polarized is public opinion on the issues themselves?" "E.J. Dionne’s latest column notes there is majority consensus behind ideas about ”economic justice” and the safety net, but that it’s obscured by the degree to which one party remains captive to a conservative minority that wants to unravel that consensus... Majorities support immigration reform with a path to citizenship. While people tell pollsters they don’t like Big Government, they support getting our fiscal house in order through a combination of spending cuts and tax hikes, as Democrats want, and majorities oppose cuts to Social Security or Medicare. Large majorities support federal spending on infrastructure to create jobs. Majorities backed the core ideas in the American Jobs Act, which included spending on road repair and tax credits for job training, paid for by taxes on the rich." "As David Wasserman explained just after the 2012 elections, geographic voting distribution patterns and redistricting has created a GOP lock on the House by cossetting Republicans away in safe districts, where they enjoy the support of “an alternate universe of voters that little resembles the growing diversity of the country.” ...Add it up and the stalemate in D.C. in the face of major challenges is at least partly due to this unconventional, unbalanced situation, and may be partly in spite of the state of national opinion, not because of it." "We need more good political science getting to the bottom of what’s really causing all the gridlock and sense that the country is hopelessly polarized." First - Stipulated: Redistricting and gerrymandering are a corruption of the political process. But it's not new. And nobody does it better than Democrats. Even when California passed redistricting reform, the Democrats managed to game the supposedly non-partisan process to their advantage. And as the Daily Show humorously demonstrated, the Picasso of the gerrymandering arts are the Democrats who created IL District 4. So let's dispose of this absurd notion that the only reason America does not embrace its progressive future is due to a few illegitimately elected Republicans in the House of Representative. If the Republicans are there because of redistricting and gerrymandering, so are the Democrats. There is no difference. Recall that Americans improbably chose to put the GOP in charge of the House of Representatives in the historic 2010 midterm wave election. They did so for a simple reason - President Obama and the Democrats scared the living bejesus out of them by passing truly bad bills (see legislative abominations Porkulus and Obamacare) on purely partisan votes. The Republicans in the House are doing exactly what they were elected to do: shackling the President and moderating or stopping his progressive economic agenda. That is why they won control of the House. That is why they've maintained control of the House. 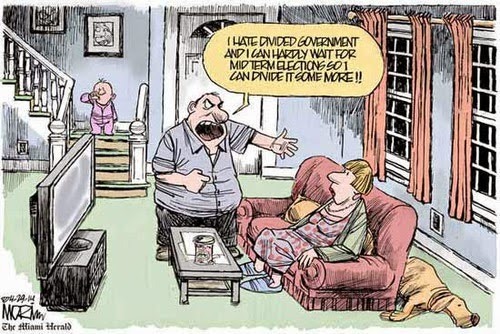 That is why they will expand their majority in 2014. That is why they even have a chance at taking majority control of the Senate. Second - If you really want to understand what is "causing all the gridlock", you need to look past your divided government scapegoat. Political scientist David Mayhew showed definitively that divided government does not correlate with legislative productivity in the modern era. 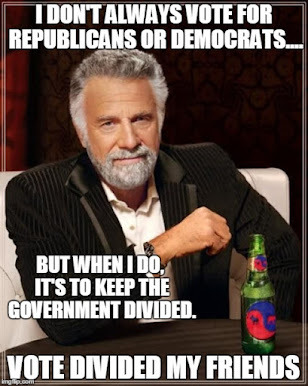 You can have gridlock in unified or divided government, and you can have an explosion of legislative productivity in either unified or divided government. So if it's not divided government per se that determines congressional productivity, what is it? I submit for your consideration that the blame or credit resides with the occupant of the White House. Last week John Harwood analyzed one of the most significant legislative achievements to be accomplished under divided government. The Reagan administration passed immigration reform, tax reform, and a nuclear weapon reduction treaty with the Soviet Union while a lame duck president and coping with a partisan divided Congress. You can make the case that Bill Clinton's legislative accomplishments while working in a highly polarized partisan divided government were equally impressive. In both cases, the common thread was the willingness of the president to stand up to vehement opposition from their own party. This is where President Obama differs from both Reagan and Clinton. President Obama chooses instead to rhetorically and legislatively pander to his base while striking a confrontational posture with Republicans. That's a good way to solidify political support from his base. It is also a good way to ensure that nothing gets done in Washington under divided government. Reagan did not have legislative success because he browbeat Democrats in Congress to behave more like Republicans. He did it by making his own party, the Republicans, behave more like Democrats (tax increases, illegal immigrant amnesty, nuclear arms reduction). Clinton did not have legislative success because he browbeat Republicans in Congress to behave more like Democrats. He did it by making his own party, the Democrats, behave more like Republicans (balanced budgets, NAFTA, welfare reform). The answer to Sargent's question on who or what is primarily responsible for the gridlock? It's the President of the United States. It's up to him. If he wants his gridlock, he can keep his gridlock. Period. Third - There are worse things than being "mired in dysfunction and gridlock" as a consequence of being "hopelessly polarized". The American electorate have decided that one of those worse things is permitting President Obama and the Democrats to have a free hand to pass an agenda without Republican support. Sorry, Greg. Elections have consequences.